A Trusted Local Electrician in the Northern Suburbs with Lifetime Workmanship Warranty: Are Home Solar Systems in Melbourne Worth the Investment? Are Home Solar Systems in Melbourne Worth the Investment? I am frequently asked by customers if Solar Systems in Melbourne are a good idea. The answer is not easy as there are so many factors to consider. If the customer's only objective is to help the environment, then thats other story. 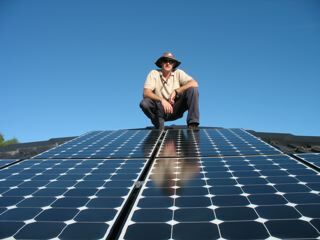 But for most people (I would say) who install a Solar System, its all about the savings!!! Well what are the savings? What factors will limit the savings and most importantly how many years will have to pass before I have saved enough to offset the initial outlay to actually start saving money. If you are interested to know if its all worth it, drop me a line and I'll work it out for you. Here are the details I need from you. 1/ The size of the proposed system in Kilowatts (KW). 3/ What your Feed-In Tariff would be. This is what you are paid for Electricity passed back to the grid. 4/ How many KWH's you use on average every 3 months. 5/ Total cost of the Solar System (after any govt rebates) plus any meter change charges.